Does coconut water help re-hydrate as well as sports drinks? 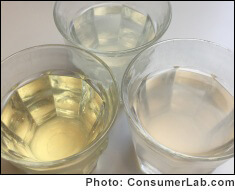 As explained in ConsumerLab.com's Review of Coconut Waters, coconut water has been shown in a few small studies to help with rehydration just as well as sports drinks — although plain water may be sufficient for simple rehydration. However, coconut water that is not sodium-enriched will typically contain far less sodium than a sports drink and, therefore, may not be as useful as a sports drink after intense, prolonged exercise. Be aware that coconut water contains much more potassium than either water or sports drinks and, consequently, drinking too much coconut water can have a laxative effect due to the action of potassium. There have even been reports of dangerous increases in blood levels of potassium in people consuming excessive amounts of coconut water. I wish that this point would be ADDED to the Coconut Water Review as a possible cause of the dangeroulsy high potassium blood level, that these persons may also have been avoiding sodium at the same time. I am also curious as to how some coconut water manufacturers have responded or would respond to what you reported, to round out your warning about consuming coconut water daily. I thought too much potassium could be a cardiac danger? Hi Sandra - Yes, please see the "Concerns and Cautions" sections of the Coconut Waters Review (https://www.consumerlab.com/reviews/_/coconut-water/#concerns -- linked to from the answer above) and the Potassium Supplements Review (https://www.consumerlab.com/reviews/_/Potassium/#cautions) for more about potential effects of getting too much potassium. This CL Answer initially posted on 7/9/2014. Last updated 4/25/2019.